In 1987 my family moved to the municipality of Sinop, a small city in the north of Brazil (135,000 inhabitants). We came with the hope of finding a better life in the face of the difficulties spent at that time... and we have been here for 30 years! The time passed and the affection for this city solidified in my heart, one of the great dreams that I had was to see his name appearing in Brazil and in the world. 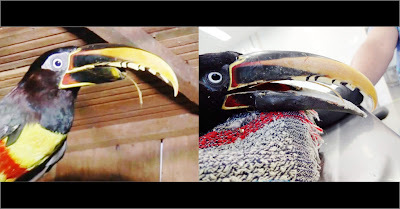 With a lot of work and dedication I was able to make my small contribution to see this happen, but the most notorious fact was undoubtedly an unprecedented project that yielded until the visit of a European news agency in this municipality: the first prosthesis of aracari in the world printed in 3D! In August of 2015 the firemen of the city of Sinop, in the interior of Mato Grosso, received an unusual call. A bird very similar to the toucan was found in the forests of the region with the broken lower beak. Sent to the Association of Rehabilitation and Reintroduction of Wild Animals (ARRAS), the aracari (P. castanotis) can find better conditions, keeping alive and fed by specialists in wild animals. The news of the animal with the broken beak was posted on a local website and addressed in its content the possibility of making a prosthesis to replace the damaged structure. Coincidentally, less than a month before our team had created the carapace of the Freddy Turtle, using 3D technology. Because of this, a number of people sent me the link and asked if I could do anything about the aracari. I contacted the firefighter who had discovered the animal and he put me in contact with zootechnician Dr. Paula Andrade Moreira and veterinarian Dr. Vanessa Nachbar, both volunteers in the care of abandoned animals in the region. After talking to the two of them, I went to the place where the bird was and I met him "personally". I discovered that his name was Tuc-tuc, and that if he was docile and had adapted well to living with humans, on the other site he still had a pair of well articulated beaks that pressed without mercy the unwary who took him to examine. At first I tried to scan the beak through the photogrammetry technique, but the process proved almost useless against the precision we needed. At that time we still did not use the dental mold making. In addition to the difficulty of raising the volume of the beak, we would need to enable the placement of the prosthesis by the specialists of our team, but all were in the state of São Paulo and bring it to Mato Grosso would be a very expensive endeavor. The months went by and the hope was fading, until appear the possibility of TecnoFASIPE, a computer event idealized by the faculty where I teach Computer Graphics classes (I'm also a coordinator of TecnoFASIPE). One of the members of the team of animal prostheses, Dr. Paulo Miamoto was invited to lecture at the conference. I imagined that this could be one of the necessary steps for the Tuc-Tuc prosthesis, since Dr. Miamoto was responsible for the replication of the nozzles, an accurate technique that aided the digitization of these structures. In addition he also printed the prostheses and subjected to a treatment that increased resistance and made them more pleasing to the eye. Faced with an emerging possibility, I activated the other members of the team and I decided to sponsor one of them coming to the city. He was Dr. Sergio Camargo, respected Veterinarian, surgeon and specialist in spouts. Another member chose to come to the city on his own, Dr. Rodrigo Rabello, also a veterinarian and surgeon. In the meantime, I coordinated with the SEMA (a Brazilian agency that takes care of animals) specialist, Sandro Depiné, the documentation necessary for the surgical procedure to take place. I also had the honor to meet Prof. Dr. Elaine Dione, Veterinary anesthesiologist, representative of the UFMT Veterinary Hospital in Sinop. To close the initial coordination process, I closed with a French news agency to follow the placement of the prosthesis, ie the event would yield an international story! Taking advantage of the arrival of the French, I chose to insert the participation of local experts in the design of the beak. I contacted two well-known dentists in the city, Dr. Paulo Bueno and Dr. Bruno Tedeschi. For 3D printing I got the support of a former student named Cristian Saggin. I still got a sponsorship for the stay of one of the specialists, thanks to the generosity of a local company, the Centauro Systems. It was insane work, at the same time as I recorded with the staff, I also helped coordinate the project. All the steps went well, we were able to replicate the prosthesis making technique here in Sinop, in the interior of Mato Grosso, just as we did in São Paulo. The first step was to create a replica of the beak. The structure was immobilized and a negative was generated, without the need to sedate the animal. This negative was filled with plaster and then destroyed for the retort to be removed. The replica received a series of tracings for the photogrammetry algorithm to digitize it accurately. The replica of the beaks made in three stages: 1) Full beak (closed to have an idea of the structure), 2) Top nose (rhinoteca), 3) Lower nozzle or gnatoteca. This is necessary, cause we align the prosthesis in relation to the nozzle with the complete structure. By the way, the prosthesis is created using as reference a donor, in this case, the corpse of an aracari of the same species. The surgery was performed on April 17, 2016, successful, allowing the animal to feed naturally as soon as recovered from anesthesia. Unfortunately not everything went as expected. A macaw, Gisele, who would also receive a prosthesis did not withstand some complications during surgery and died. I was very sad at that moment and this feeling was captured in the story edited by the French. Even so, we learned a lot from the process and even though the macaw has gone... it certainly helped a lot in the history of making veterinary prostheses. The procedure had wide repercussion, both in Mato Grosso and internationally. The material edited by the French reporter Zinedine Boudaud was broadcast on the open TV of France and Germany. The CBS TV also presented material, the most curious being that we even heard about Tuc-tuc. As soon as the work was finalized, we received of a motion of applause offered by Sinop's City Council, a project of the councilor Fernando Brandão. For all of us, it was a tremendous honor, to see Sinop emerging in the world and bringing good news, tied to scientific scholarship. We thank all those who helped in the project, enabling it and allowing one more life to find fulfillment. Roberto Fecchio (Veterinarian, leader of the Avengers), Profa. Dr. Elaine Dione (Postdoctoral Veterinary Surgery with Emphasis in Veterinary Anesthesiology), Fátima Escalabrin (Psychologist), Sandro Depiné (Sema), Anderson Eduardo Wagner (Green Action Institute), Cris Cesco Diel (Biologist, Specialist in Environmental Law And Sustainable Development), Ailton Santiago (Forest Park), Prof. Dr. Paula Moreira (Zoothecnist, PhD in Biological Sciences in the Animal Behavior Area), Dr. Vanessa Nachbar (Veterinary Medicine), Cristhian Saggin, Dr. Everton da Rosa (Bucomaxillo Facial Surgeon) Dr. Paulo Bueno (Dental Surgeon),Dr. Bruno Tedeschi (Dental Surgeon), Raissa A. Chagas Martins (Veterinary Medicine), Dr. Luiz Fernando Bianchini Venâncio (Veterinary Medicine), Patricia Ribeiro Barroso (Veterinary Medicine), Dr. Raquel Giachini Dr Rodrigo da Costa (Veterinarian), Lis Caroline de Quadros Moura (Zootecnista), Deivison Pinto (President Fasipe President), Adriano Barreto (ADS Course Coordinator - Fasipe), Klayton Conçalves, Cesar Rosenelli, Rodrigo da Costa, Jamerson (Reporter), Desirêe Galvão (Reporter), Andressa Godois (Reporter), Zinedine Boudaoud (Reporter), Melice Losso (Reporter), Laércio Romão (Reporter), Edneuza Trugillo and Luíza Trugillo.